Reyner Banham once observed that in Los Angeles “mobility outweighs monumentality.” What was true for the automobile is fast becoming true for the home. It is possible today to live on wheels, to be completely transient and yet remain completely connected. Noted contemporary architect Ted Kane takes a critical look at how city life predicated on total mobility and utterly dependent upon the corporate-controlled wireless world is expanding the meaning of urbanity while constricting the bedrock virtue of citizenship. It is possible today to live on wheels, to be completely transient and yet remain completely connected. 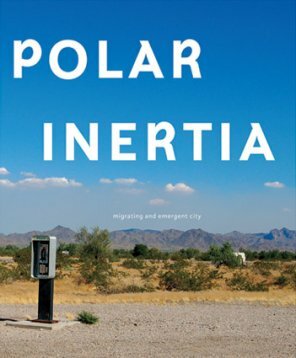 In Polar Inertia, Ted Kane’s snapshot-like photographs accompanied by his critical writing examine the transformative qualities of cell phones, satellite dishes, RV’s, and taco trucks on urban form. An absolute “must have” handbook to anyone thinking of an alternative lifestyle while still connected to their Blackberry. Introduction by Greg Goldin. This project was made possible by the support and funding of the Los Angeles Forum for Architecture and Urban Design, the City of Los Angeles, Department of Cultural Affairs, the National Endowment for the Arts and the Graham Foundation for Advanced Studies in the Fine Arts.